A&E APRIL 2019 • a-e-mag.com 49 Sandcarving Most of these paints are water-based, which dry permanently. That is an impor- tant consideration when it comes to your health; these paints do not require solvents for cleanup, which would require serious mask protection while spraying the paint as those regular spray paints do. Regular spray paints are lacquer or enamels and are all solvent-based. When spraying these paints, wear an adequate mask and have plenty of air ventilation in the area with an exhaust for the created fumes; you do not want to breathe these fumes under any circumstances. 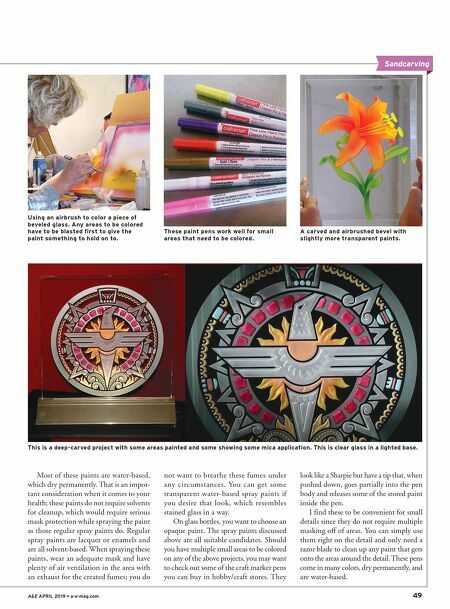 You can get some transparent water-based spray paints if you desire that look, which resembles stained glass in a way. 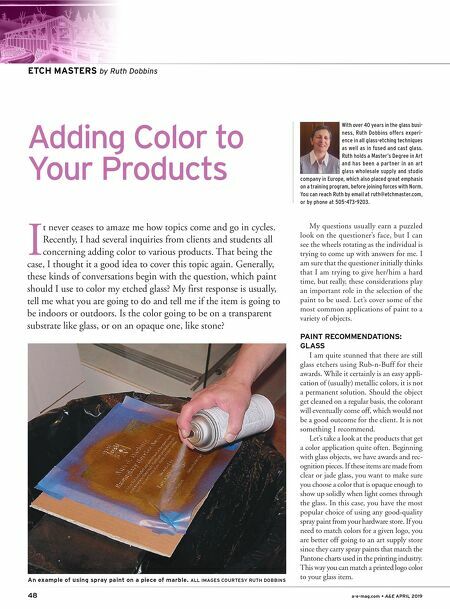 On glass bottles, you want to choose an opaque paint. The spray paints discussed above are all suitable candidates. Should you have multiple small areas to be colored on any of the above projects, you may want to check out some of the craft marker pens you can buy in hobby/craft stores. They look like a Sharpie but have a tip that, when pushed down, goes partially into the pen body and releases some of the stored paint inside the pen. I find these to be convenient for small details since they do not require multiple masking off of areas. You can simply use them right on the detail and only need a razor blade to clean up any paint that gets onto the areas around the detail. These pens come in many colors, dry permanently, and are water-based. Using an airbrush to color a piece of beveled glass. Any areas to be colored have to be blasted first to give the paint something to hold on to. These paint pens work well for small areas that need to be colored. A carved and airbrushed bevel with slightly more transparent paints. This is a deep-carved project with some areas painted and some showing some mica application. This is clear glass in a lighted base.